The G Girls are back, with a slight change in the line-up yet still completely awesome nonetheless, this is their newly released single "Milk & Honey". It's a banging tune that should be an international hit, much like many of the other songs that are released on the Global Records label. This just proves how amazing the artists on the Global Records label are and you so need to discover all the songs from these girls. We do miss Alexandra Stan in this line-up, but G Girls is a project consisting of girls from Global Records, so line-up changes are allowed since they aren't a full-on girl group as they all have solo careers; if a third single comes along, who knows if the line-up will change again. 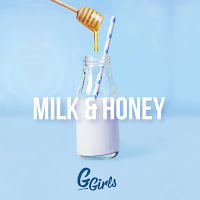 Watch Inna, Antonia, Lori, and Lariss come together for G Girls' new single "Milk & Honey", as they all compete for the attention of a photographer. G Girls is a project from Global Records that consists of female singers from the Global Records label. This is a slightly new line-up, with the G Girls consisting of Inna, Antonia, Lori, and Lariss (actual names: Elena Apostoleanu, Antonia Iacobescu, Loredana Ciobotaru, and Larisa Borza). The latter has replaced Alexandra Stan from the original line-up when they dropped their debut single "Call The Police". Lariss fuels Lori's RnB vibe, which adds a whole new flavour to this track. Imagine if G Girls ever released an album, that would just be pure versatile, yet still with the G Girls stamp. Maybe Global Records should just release a compilation album, now that is something we need. Anyhow, I previously wrote an article about this for CelebMix, and then later an article for Outlet Magazine, make sure you check them out by clicking the links. According to the composer notes attached to the iTunes digital download, the song was written by Sebastian Barac, Marcel Botezan, Isaac Breyan, Larisa Borza, David Ciente, and Elena Apostoleanu. Directed by Ionut Trandafir, with Khaled Mokhtar acting as Director of Photography, this music video is more relaxed than their debut "Call The Police". This has a nice relatable setting and isn't as high-end as the other one was before. There is one main love-interest, I don't know the actor's name, but he plays the photographer in the music video. In various settings, he plays different roles depending on which G Girl he is with. With Inna he's a fashion designer, measuring her up. With Antonia, he's a hair stylist. With Lariss, he's a beekeeper, giving her honey whenever she wants it. And with Lori, he's a teacher or a tutor. Throughout we see snapshots of the girls together posing for their pictures to be taken. The video is completely fun from start to finish. The girls are teasing throughout, all the while having a great time on set - they clearly enjoyed the photo shoot, even if there is a lot of shadow at the forefront of the visual, obscuring our view. The only problem is that there's no milk in this video, although Inna's costume is a milky white, and maybe the love-interest is a milkman when he's not taking photos, maybe there is an underlining message of what they want with their honey. Who knows? Regardless the song is fire and the girls are fierce throughout. It's a brilliant performance piece with a lot of happy energetic vibes and a spirit of fun.